“Sounddance” is one of the very greatest of dances. It is as iconic as Nijinsky’s “Sacre du Printemps,” and shares its convulsive musical and choreographic energies. 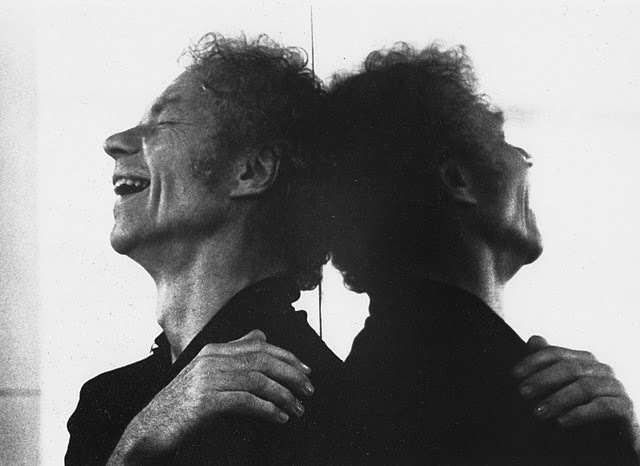 It was first performed on March 8, 1975, in Detroit, Michigan, with Cunningham in the central role now danced by his sole successor in the part, Robert Swinston, his longtime assistant, and now the current Director of Choreography for The Merce Cunningham Dance Company. You don’t have to know any of this to see the dance, of course, and I don’t think about it–though sometimes it all comes to me unbidden– mostly when I see it I am in it. BECAUSE that’s where Merce Cunningham is. You can, in a sense, visit him in this dance. It is flesh of his flesh–he was still vividly performing and demonstrating when he made it–and born in a flash. He had just returned from Paris, where he staged “Un Jour ou Deux” on the Paris Opera Ballet, and home in his own studio, with his own company, he experienced a relief from the many exasperating exactions of working with the French. He spoke beautiful French, he was honored by the French, he is revered by the French, his company is received in Paris as nowhere else; but this does not preclude a certain impatience with regimentation and protocol. Cunningham had an abhorrence of what he called “fuss.” He did, after all, to use his words, like to “bust things open.” Not only the conventions of the stage, but the conventions of making. The curtain goes up on a bare and silent stage—in the beginning is the void-– cloaked in black side curtains, with the ten vertical feet or so of Mark Lancaster’s curtained drop gleaming at the back. The empty stage, and beyond, nothing. Or nothing knowable. We see this for about ten seconds, and then the utterly fabulous percussive sound score by David Tudor kicks in, and keeps on kicking, with dense patterns of sound that are layered, like flocking on fabric, dense, rich, textured. Out of the center of the backdrop spins a lone figure. It is a significant role, for this dancer–first Cunningham, now Swinston–is a master of ceremonies. You will perhaps have seen this figure in other Cunningham works: for instance the wizard with- a -wand part the choreographer gave himself in “Signals;” the magister ludi giant-stepping across the stage in “Exchange;” the ghost-like figure in “Enter.” THE CHOREOGRAPHER, conjuring up his dancers, and his dance. This is–and there are works that can be read just the same way in the repertories of other choreographers–a dance about dance, and about dancing. About, among other things, beginning a dance company; and beginning a dance. It is also a dance that functions, as do so many of Cunningham’s nature studies, on both the microscopic and the macrocosmic levels. Birth of the universe? Creation of heaven and then the peopling of the earth? Cells dividing and redividing? For out from behind that curtain will ratchet nine more people who will mate, conjoin, polymorphously generate life in the guise of more dancing; who will tilt against the air like salmon swimming upstream, with Swinston—in gestures I don’t recall seeing in any other Cunningham work–-placing the dancers, shepherding them, and manipulating one of the women as if she were a doll. His is a position of power, and at a price: all the energy on the stage spills out from him. 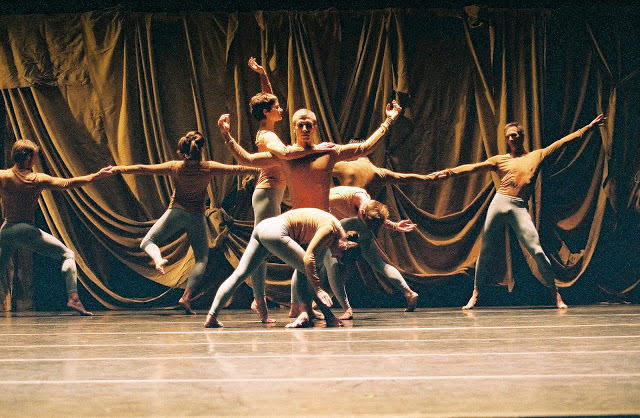 The stage teems with life, life, life–dancers caught up in constant complex lifts, spins, shifts, re-groupings, convulsive couplings and triplings. It all feels fast, but if you watch “Sounddance” in silence, without the driving force of the score, you will see that there is slow within fast, and fast within slow. A rapid overall arc, with modulated phrasing within. AT ITS END, the dance winds itself back, and one after another, the dancers are sucked–or ushered–back into the void from which they emerged. A lifetime that passes in 17 minutes. Then applause roars forth, and people surge to their feet, for “Sounddance” is an efficient and exciting energy transfer device. (It fills you up, and you send it back.) They applaud the dancers, the musicians. And of course, they applauded the choreographer. This was the last dance performed in his lifetime, on the very day he died. The company danced at Jacob’s Pillow in the afternoon, and in the evening, as thunder cracked open the sky, he took his last breath. At his last “Sounddance” in Washington, Cunningham stayed in the wings, timing the dance with his stop watch as usual, and watching it with his eagle eye. This was during a period when he had retreated from curtain calls, being too wobbly to walk onstage securely. Later–starting at the Hopkins Center at Dartmouth–he began to take bows from his wheelchair. It wasn’t the way he liked to appear, but it was practical and courteous–two of his signal characteristics. Perhaps, also, it was simply the renewal of a pleasure he had so long enjoyed–being onstage. But back then, he remained backstage. As the Kennedy Center audience cheered, his company took two brief curtain calls, and the lights came with the house still in tumult. “Where’s Merce?” someone asked. It’s a question I have been asking people since he died, in interview after interview: Where is Merce for you now? There have been many answers, some entirely surprising. But it seems clear, if you think about it on his own terms. Nancy Dalva: One of the things I learned from “Enter” is that an exit is also an entrance, and that when you’re leaving something you’re also going someplace. Merce Cunningham: You’re going to something else. Yes.